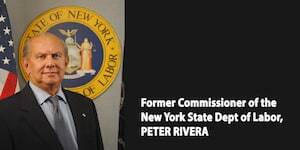 Peter Rivera was born in Ponce, Puerto Rico and represented District 76 in the New York State Assembly, which comprises of West Farms, Van Nest, Castle Hill and Parkchester. He also served as New York State Commissioner of Labor under Governor Andrew Cuomo. After a long and distinguished career in public service, Peter Rivera brings extensive experience as a politician and advocate for the Gotham team. Rivera began his career as a patrolman and detective with the New York Police Department in the South Bronx. He later became a detective where he served as the NYPD's radio and television spokesperson on issues relevant to the Hispanic community. Before obtaining his law degree, he worked as an agent with the Drug Enforcement Administration (DEA), where he played a key role in Operation Eagle, the largest federal narcotics operation in the United States at the time. After graduating from St. Johns Law School, he worked as an Assistant District Attorney in the Homicide Bureau of the Bronx District Attorney’s Office. Rivera has also had a storied career in the private practice of law since 1978. He has tried and handled many high profile cases both as a prosecutor and a criminal defense attorney. First elected to the New York Assembly in 1992, Rivera was the Chairman of the New York Assembly’s Puerto Rican/Hispanic Task force and the Assembly Standing Committee on Mental Health, Mental Retardation and Developmental Disabilities, where he convened the Mental Hygiene Work group to reorganize the Mental Health system in New York State. He also sat on the New York State Assembly Committee on Rules and the Judiciary Committee, as well as the committees on Agriculture, and Consumer Affairs and Protection. As the highest-ranking Latino in the Assembly, he fought important issues in the Hispanic community such as improved quality in education, the strengthening of bilingual education, increased access to healthcare and AIDS-related funding, and the establishment of a Puerto Rican heritage center at the renovated Bronx office of the New York Public Library. Prior to his election into the Assembly, Peter was the President of the Puerto Rican Bar Association. During his tenure, he successfully doubled the number of Hispanic judges in New York. Assemblyman Rivera earned his Baccalaureate degree in Business Administration from Pace College. Today, Peter lives in the Bronx and has two children.